The Gib Sea 312 was until the mid-90s by Gilbert Marine, which was acquired by the French. Dufour shipyard, built. She is an exceptionally sturdy yacht which initiates through a dynamic, modern building a broad, sweeping tail with the then novel bathing platform a U-turn in yacht building. The other applications are diverse: From the comfortable single-handed sailing to larger crews. To make it easier to charter guests, the traps are laid in the cockpit and the Traveler trimming can be performed from the wheelhouse. The maissail can also be seek from the cockpit via onelinereef with Storm coming. We are, incidentally, always trying to optimize by questioning the charter guests the ship further. 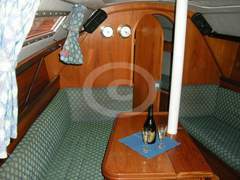 Under machine consumes only about 1.2-1.5 l / h, The Yard rotates due to its keel "on the plate". Experienced sailors turn the ship in as only 20 meters wide port entrances - even under sail. There is an approval by the for up to 6 people. For longer trips up Crew strengths of up to 4 persons have been proven. 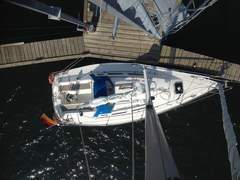 An elaborate rig refit took place 2016th It was purchased a lath mainsail. The Genoa has also been renewed and has besides UV protection is also a foam-flow for enhanced performance. Also new were running / standing rigging, shrouds, mast. 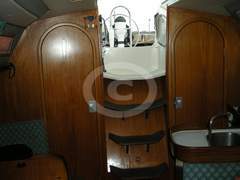 Headroom in the up to 210 cm long rear bunk and in the bathroom about 175 cm. Foredeck: 176 cm. Salon up to almost 190 cm. Tablet with lake-card similar to the new paper charts set, WiFi (free of charge in its own ports) and other useful apps (Windfinder, AIS, etc.). The DSC radio from 2015 is powered by the GPS (Furono) with the position. In large for the size of the ship bathroom there is a also large closet for wet stuff. 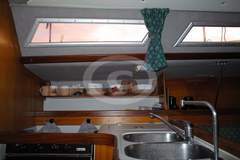 The galley, separated from the salon with U-and I-bed is equipped with gimballed 3-burner gas stove incl. Oven. Also available: A cool box which even an ice cube tray included. 2 sinks (switchable saltwater to freshwater) with pressurized water and additional foot pump. In the fore deck area is in the center axis more than 190 cm. The maximum width of the shoulder height is about 150 cm. Thus, there is enough space for 2 normal sized adults. Headroom inside: up to 185 cm. In the 210 cm long aft cabin 2 adults 3 children or even have space. Of course the ship is maintained in the winter months for a maintenance plan. In 2015 came as the water pump and the starter again. Parking is free at the keel line, the Kiel Promenade, and after about one hundred meters to the ship. From Schilksee, the Olympic Port, to Seeburg, which is located right next to the Cruis ship investors in close to downtown. - 24hr hotline - In urgent cases, we stand by our charter guests 24 hours a day, - 7 days a week via our hotline. - SMS Forecasts: - For weather alerts we caution by SMS (in Germany). This service is also free. - provisions Service: We loaded before the ship and go shopping for you (extra charge). - Station Transfer: If the train arrival / we pick up our guests from the station if required. - Our Laundry: Upon request, we also offer complete bedding with towels (at a surcharge). - Comprehensive log "Gretchen" with sailing tips, jam and valve schedules, inter alia. Also available online: Of course, information on the Kiel Bay, the harbor and everything else you need to know that. We provide for your charter week / s in the first 1-2 days an experienced "sailors" who will accompany you and pointing to the particularities of Area and / or of the vessel and also a small skipper training can attend with you. This can be the owner of the yacht to be designed by you or an experienced skipper. To this end, we will send you a customized offer.